Robirdo is a huge, robotic version of Birdo that appeared in the game Super Mario Advance, a remake of Super Mario Bros. 2. It replaces Mouser from the original game as the boss of World 3-3. Robirdo speaks with a robotic version of the regular Birdo's voice, and even uses one of her direct quotes upon being defeated: "How could you?!" Its name is a portmanteau of "robot" and "Birdo". In Super Mario Advance, Robirdo is an added member of the 8 bits, which helped Wart conquer Subcon. Robirdo has three attacks in battle. The first attack is a classic Birdo attack - firing eggs from its mouth. This is immediately followed by its second attack, which is charging directly towards the player. The seven chains hanging from the ceiling assist the player to avoid this attack. The third attack is used once Robirdo has been damaged - a Ground Pound-like jump that immobilizes the player. The charge also follows the third attack. The only way to damage Robirdo is to throw the giant eggs, which it shoots from its mouth, back at it. It takes five hits to defeat her. The ending credits depict her without the bow just like the normal Birdoes were originally depicted to be consistent with the characters retaining their NES sprite counterparts in the ending credits. 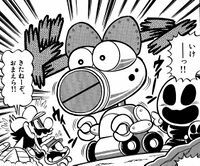 Robirdo makes an appearance also in volume 26 of Super Mario-Kun. It appears in a short segment involving Super Mario Advance at the end of the chapter of the main story. The Shy Guys unleash Robirdo on Mario, but Mario defeats it by throwing a Mega Guy at it. This page was last edited on April 4, 2019, at 23:59.